I haven’t read Becca Fitzpatrick’s Hush Hush series, so it was my first time experimenting with her writing style. Although this book is completely different from Hush Hush, I actually really liked it. Black Ice is a thriller/mystery novel about a girl Britt and her bestfriend Korbie going on a camping trip in the mountains. Korbie’s dad insisted that Korbie’s brother (who also happens to be Britt’s ex- boyfriend), Calvin tags along as a chaperone. As the two girls where driving alone up the mountain, the car stops and a snowstorm hits; so the girls walk for miles till they reach a shelter to stay the night in until the snowstorm comes to an end. When they finally reach one, they were introduced to two hot guys in their early twenties; Shaun and Mason. Britt and Korbie both call shotgun on Shaun and start flirting with him, the next thing they know they both were being taken hostages and they were being used to find an escape off the mountain. Britt was the useful one, who has been training and was familiar with the mountains and had survivor skills, while Korbie was being pathetic and whiny and utterly annoying. As things progress, Britt begins having feelings for Mason, but she was unsure of it since he’s the guy who held her captive and she was doubting her emotions all the time claiming that she maybe is suffering from Stockholm Syndrome. One thing that I really did admire in Black Ice was the incredible progression of the situations, it was very fast-paced and it kept me on edge the whole time; I finished the book in one sitting! Although, I didn’t feel like the writing style was my favorite and I disliked all of the characters, I was actually a huge fan of Becca Fitzpatrick’s development of Britt’s character in the end and her ability in writing a thrilling and an exciting novel. I honestly did feel like the book was being boring towards the middle, I had the urge to stop reading several times, but I didn’t let that get to me. I can say that I skipped - well actually not skipped, but skimmed over- some parts that I found really irrelevant. As I said before, I disliked the characters, I felt like Korbie was a waste of characters (and oxygen), I felt like the girls were so immature at times that you wanted to smack them. This book gave me serious trust issues, I did like that I couldn’t trust ANYONE at first and towards the end, it really confused me but I pieced the puzzle and I figured out the murderer before it was mentioned. The murder aspect and the setting were the reasons I liked this book and gave it a not so low rating. I don’t know why the hell Britt is still friends with Korbie, she is extremely mean to her and always trying to be better than her. When Britt found out that list, it should have been an indication that this friendship is a fail anyways, she should have confronted Korbie right away; but then again, Britt doesn’t always make the smartest decisions. I hated Calvin so much, since the very beginning, Korbie and Calvin are more like each other, they were both willing to cheat, the fact that Korbie was like “yeah but Bear isn’t here” made me so angry at her! Cheating runs in the family I believe. Britt also annoyed me. She is the fictional character of 13 year old me, she humiliated herself and was dumb enough to create a love story with Calvin and convinced herself that he loved her as much as she loved him when in fact, he was an a-hole who didn’t deserve her. The fact that she was 17 and she still didn’t realize that she needed a reality check is annoying! She was incredibly immature and it reminded me of how I was years ago. Calvin was a carbon copy of my ex-boyfriend, except for the fact that my ex wasn’t a murderer and wasn’t a cheater; but he actually was a douche and treated me terribly. Yet again, I was 13!!! I knew nothing, I was a kid, I can’t fathom the idea of Britt being so infatuated with a complete air-head who used her multiple times and CHEATED ON HER, he didn’t want to declare her as his girlfriend which surprisingly enough, she didn’t disagree to! Oh Britt. I really liked the mystery factor, I was so confused and couldn’t trust anyone , I thought that Shaun was creepy at first and his hospitability was an act, but I was mad at Britt and Korbie for not getting the clear picture and fighting over a guy WHO THEY JUST MET and could be a murderer (which he was). I hated that the girl drama blinded them to a point where they couldn’t realize where the real danger is, it was right there. To add to the list of characters I didn’t like, KORBIE’S DAD. Who kills a dog for barking? He was vicious and again it imprinted on Calvin. I couldn’t blame the guy.. he had a psycho parent and I didn’t expect that he would turn out perfectly fine, he had to be somehow unstable. 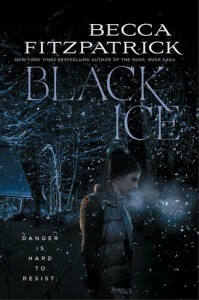 If you have read Black Ice tell me in the comments down below what your thoughts were!